We just hosted a May Day celebration, and this was one of the young adult participant’s first experience with a maypole! 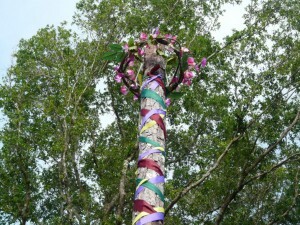 That was so sad, when I recall the regular maypole dances we had as children in the public schools in the early 1960’s. 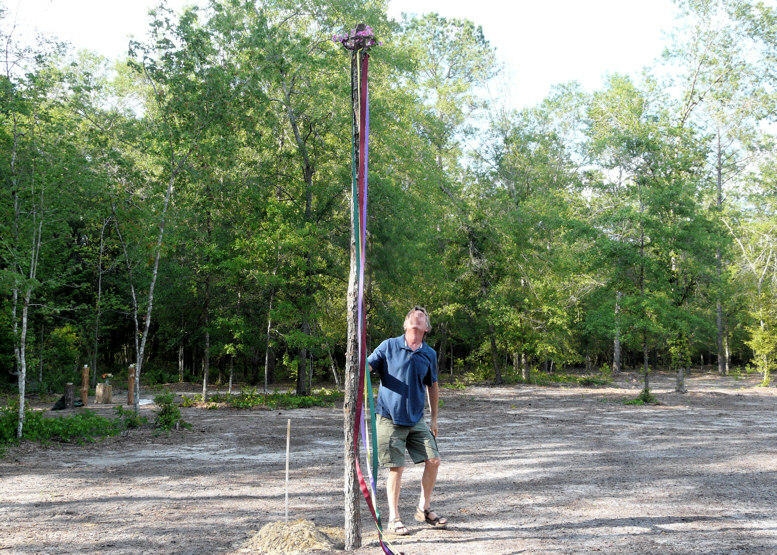 So to help spread the dancing o’ the Maypole, here are some instructions on how to make one. 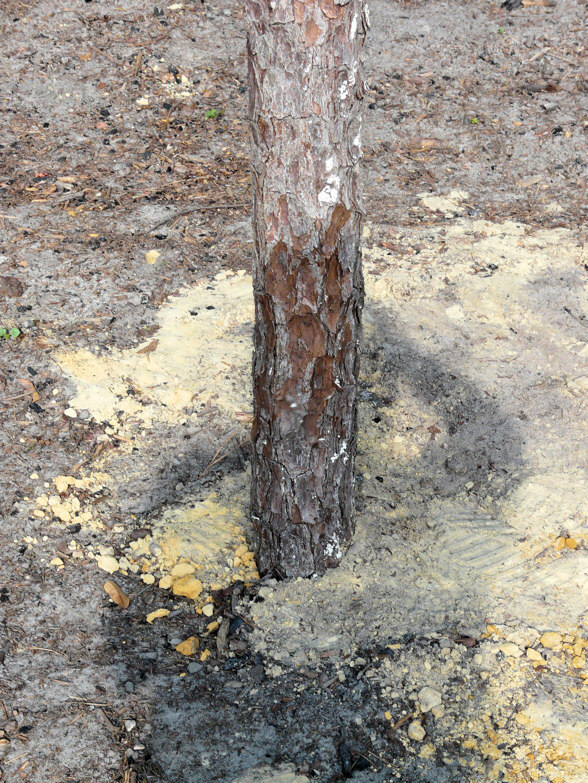 We started by cutting down a leaning (therefore going to blow down soon) pine tree. 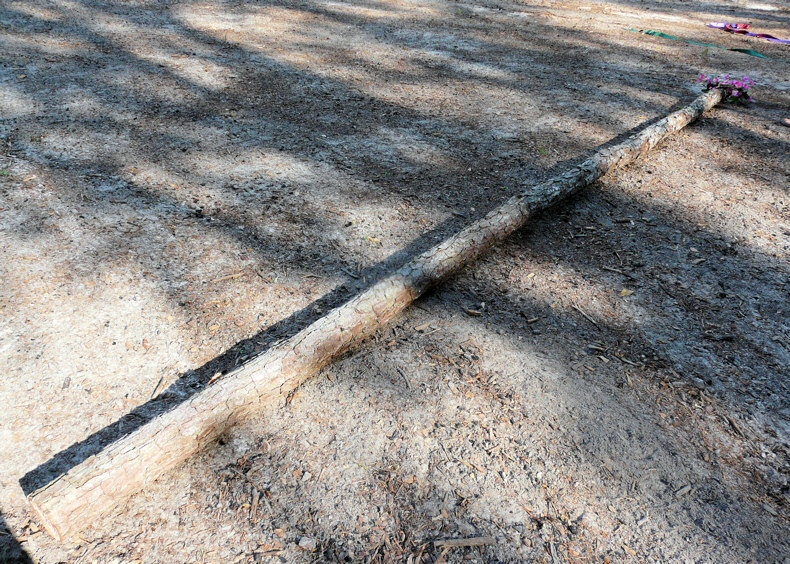 Traditionally only certain trees were used, but any straight and strong tree will work. We checked to make sure the trunk was solid, and trimmed the limbs, top, and bottom of the pine off to end up with a pole 16′ long. Our pine trunk, trimmed and ready to use as a maypole. Spools with 1.5″ ribbon ready to cut for the dancers, and player for music. Wreath is attached to top of pole. The green wire has dance ribbons tied to it, and is being made into a ring around the pole. 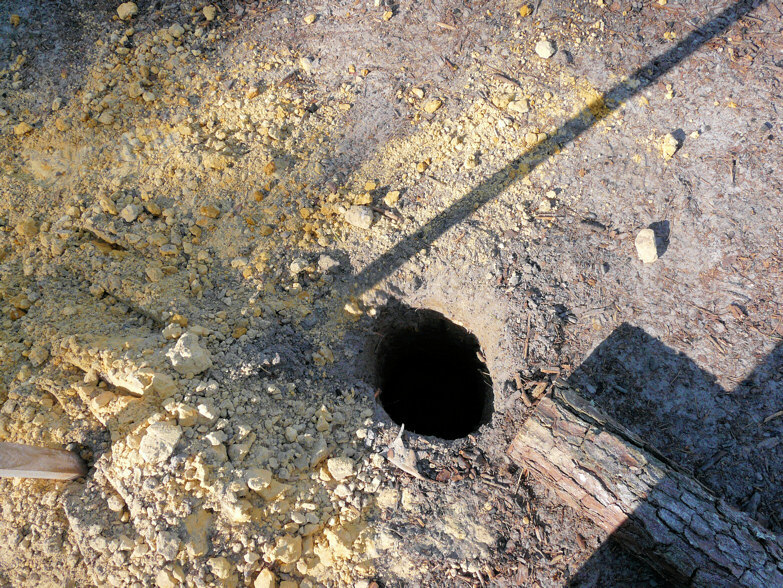 Maypole in the ground, with dirt tamped back in. We used a standard dance with an even number of dancers, each holding their ribbon all the way out from the pole. Every other dancer moves clockwise (with the sun) and the other half moves counter-clockwise (against the sun). The clockwise folks start with ribbons up, and the counter-clockwise folks with ribbons down (or vice versa, as long as everyone in a direction starts the same way). After you pass your first person coming in the opposite direction you move your ribbon to the next position. So you end up with 2 rings of people going two directions, and going over and then under people with your ribbons. 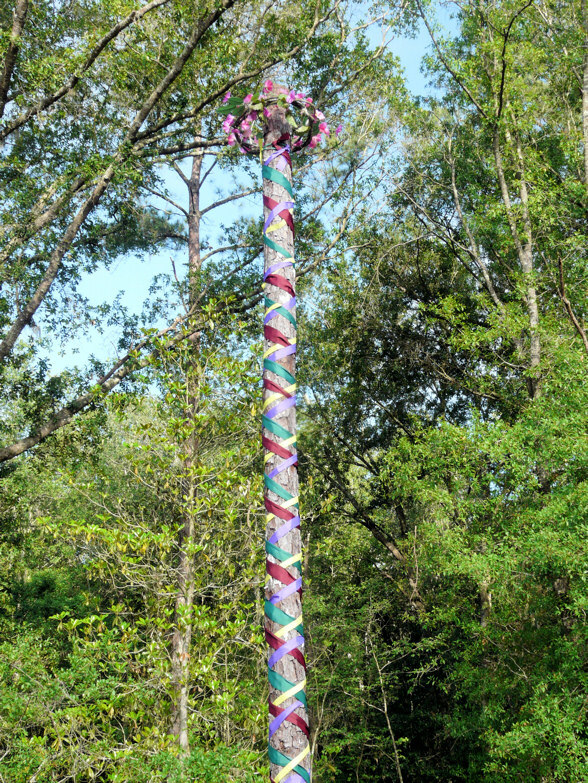 When you have enough people it can make a very nice woven pattern on the pole. But if someone breaks the pattern it makes the dance fun, and the ribbons still look nice on the pole. We had recorded music that started at a nice walking pace and then got faster- which is what will happen as your ribbons get shorter during your dance! At some point you’ll all be happily running into each other, and you’ll be out of ribbon. 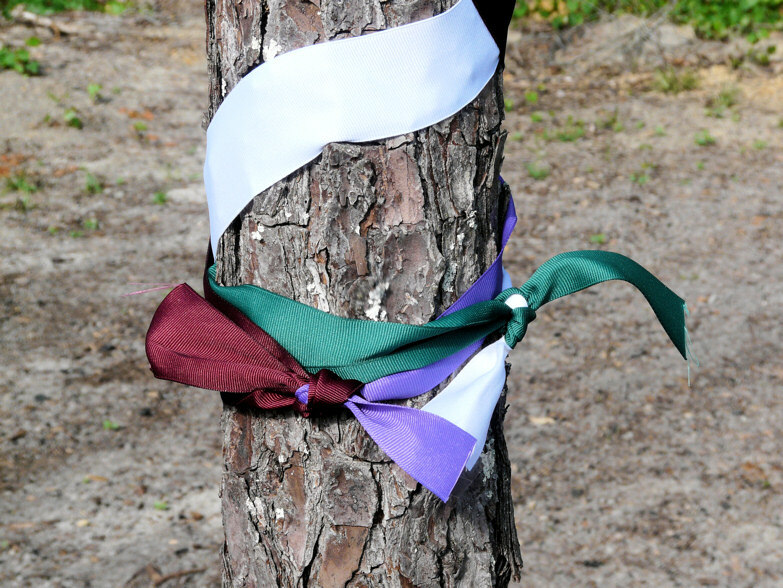 You can tie off the ribbons at the bottom of the pole and step back and admire what was created! 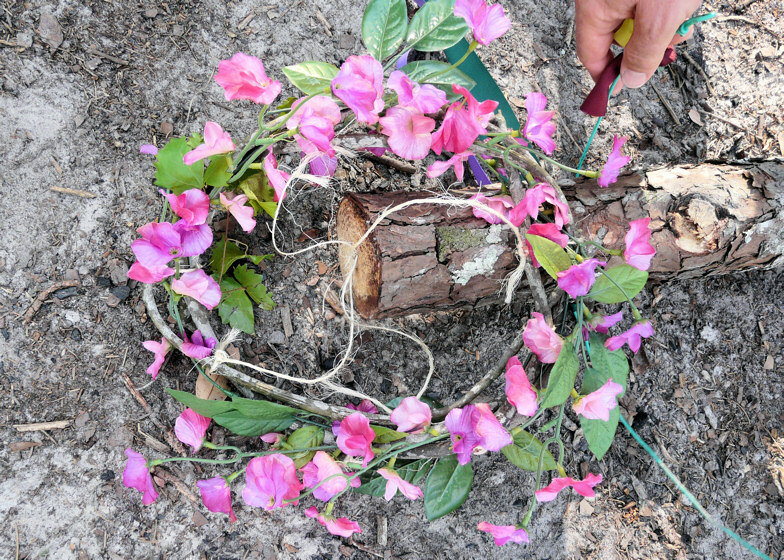 This is just the way we made this maypole- try out your own methods. 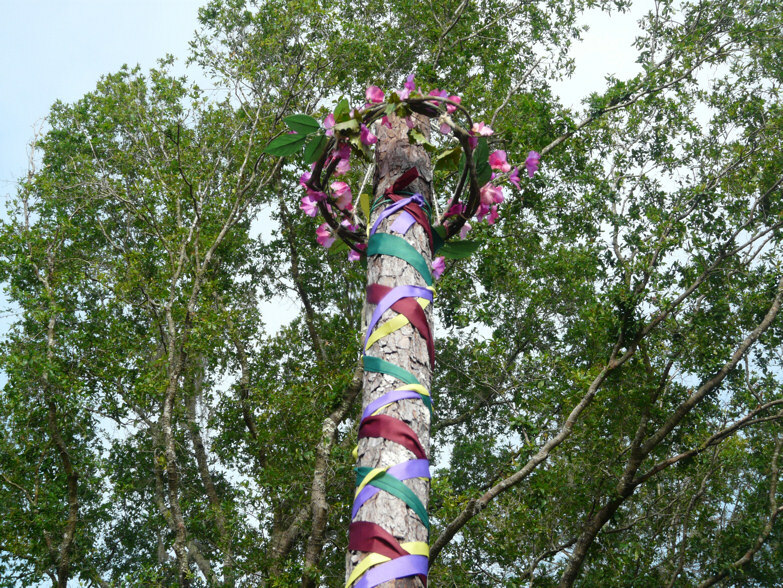 Dancing a maypole is a spring activity in many cultures, it’s easy to do, and it’s a whole lot of fun. Enjoy a-Maying! 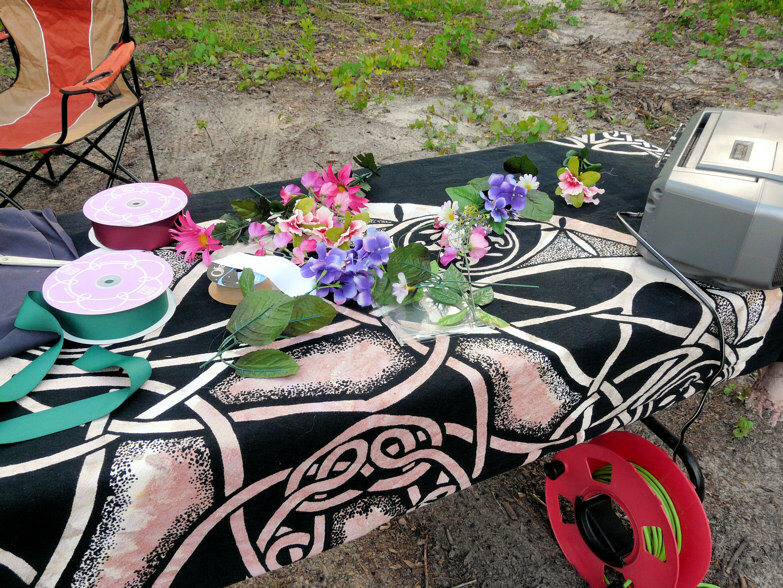 For more on Beltane/May Day celebrations go here.